An innate adventurous streak has taken Galway’s Damian Browne from the rugby fields of Ireland and France, to the mountains of Afghanistan and Peru, and now, hopefully, across the Atlantic as a solo oarsman. Part of his DNA which ensured a successful rugby career is a determination to test himself, and having retired from professional rugby two seasons ago, the 36-year-old is not one to let the grass grow under his feet. 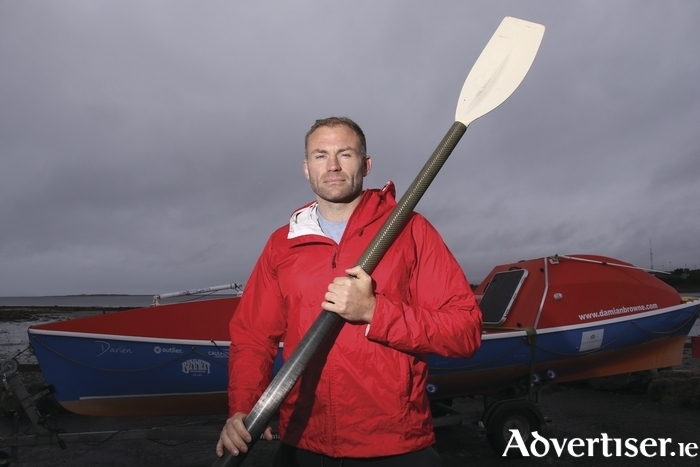 His latest in a series of adventures since hanging up his boots is to follow in Gavan Hennigan’s wake and take part in the Atlantic Challenge, billed the world’s toughest race. To do so Browne is back home with his family in Renmore for the first time in 13 years, having played in the English premiership with Northampton, the Pro 12 with Leinster, and the Top 14 in France with Brive and Onnayax after moving on from Connacht Rugby. He describes his love for adventure as something of an evolution, spawned from the physical rewards of playing rugby. “I always had a great interest in the mental and physical connection, and how they were synergistic - when you push yourself physically the benefit you receive from that mentally - and that is why I really wanted to try certain challenges. When I tried one or two, it was always what’s next, what is better, bigger, longer, higher, more daunting. During his rugby career Browne, brother of current Connacht player Andrew, attempted his first challenge - a high altitude trek in Peru. “It was not really challenge as such, but I found it really challenging,” he says. “I had never done altitude before, and I had no knowldge of the effects it can have on you. I turned up with a 10k backpack with my laptop and all my electronics, and it was a 42 km trek over four days. After half an hour I was asking what I had let myself in for, but I persevered. We reached over 4400m and I got huge rewards from it. Although Browne swore he would never attempt another mountain, Kilimanjaro came calling. On retiring from rugby, Browne says life has truly been “a bit of an adventure”. Browne took off travelling for six months, ticking off places on his bucket list that were outside his comfort zone - Kenya, Tanzanaia, Rwanda, Uganda, Ethiopia, Mauritania, Afghanistan, Iceland - before returning to Paris where he studied photography as “a means of exploring my creative side”. “After visiting these amazing places in the world, I really wanted to learn how to capture moments and life there. When I’m travelling alone, it can often lead to becoming immersed into a country. “Travel really gives you appreciation - opens your eyes and gives you perspective on your own life. It is a time to get away from the clutter that surrounds you. I know it’s a bit of a cliche, but to be in the moment a little bit. When you are in the mountains of Afghanistan, you have a lot of time to think when walking 12 hours a day, and you come back more in touch with yourself. For me there is always that urge to go and travel because I know it will give me a lot of good stuff. On returning to France, Browne embraced his next challenge, the Marathon Des Sables, something that been at the back of his mind since his Connacht playing days after Galway’s Donovan brothers had completed the 230km Sahara race. Although 6.6” and some 120kgs, Browne completed the toughest race on earth, while also raising money for Irish Motor Neurone Disease and Amani Children’s Home in Tanzania. If the Sahara ultra marathon is the daddy of them all on land, the Atlantic Challenge is the toughest on water. Now Browne is in the throes of preparing for the next instalment that starts in December, encouraged and helped by fellow Galwegian Gavin Hennigan who became the second Irishman to complete the solo row last February. Browne has invested a significant amount to guarantee he crosses the starting line and is hoping to recoup some through sponsorship. Now with his boat purchased, Browne is in training in Galway Bay and hopes his years in rugby will be an advantage. “I know how to prepare my body because that was a huge part of my life for so long. You are in a system where it is not a choice, you have to do it to survive in that world, so you learn to love it, but I’m a novice in the boat. We have to be a jack of all trades, captain, crew, cook, and fix anything if it breaks - that is a big fear, it’s a big work-on for the next six months because I’m nowhere near efficient now. “I am really really excited about the whole project - it is starting to come together - the physical and mental side, technical training, sponsorship and the charity fundraising. Browne made an unusual but brave move to opt out of college in 1991 and train solo for a year to become a professional rugby player. He succeeded, forging a successful career with Ireland u21s and Connacht before crossing the channel. He admits to never finding anything quite like rugby. He is sure making a great fist of trying. Will Galway ever do ‘socially responsible sustainable’ planning? Page generated in 0.2002 seconds.